In the school museum itself, in the Aelberry building situated behind the school, and in the adjacent Joseph Wright Hall we have facilities available for hire. The Wilderspin School is an evocative and unique location with period schoolrooms to give your event a unique setting. The Varah Room in the Aelberry Building is a modern meeting room for up to 20 people. 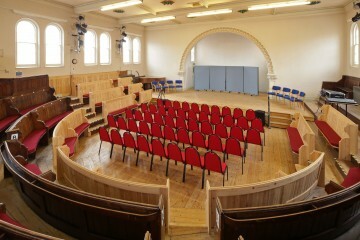 The Joseph Wright Hall has a first floor theatre / auditorium incorporating the upper gallery of the former Primitive Methodist Chapel (1867) to create a novel space for lectures and performances. Access is by stairs only – although there is a stair-lift. The spacious ground floor Community Room is ideal for meetings, presentations and family events. It can accommodate 16 tables for fairs and similar events. Additional space is available for more stalls and supplementary activities. We are flexible with our venue hire – you can hire one room or the entire building(s) for a couple of hours or all day. We can provide you with catering but are equally happy for you to bring in your own. Because we are flexible, so are our hire rates. Please give us a call on 01652 635172 to discuss your hire needs and we’ll see what we can do for you.